Fantastic quality vectors are fundamental building blocks for all designers. That is why it is so important to have a great selection of vector tools at your disposal, and this bundle gives you just that and so much more! This supply kit would typically cost you $2995, but for the next 2 weeks it’s available for you for just $29! Discover thousands of vector brushes, illustrations, textures, patterns, shapes, florals and more, in a variety of styles including festive and vintage! Also included is a stunning selection of fonts that will compliment your new vectors perfectly. The Totally Artistic, Vector Supply Kit is a collaboration with the best vector designers in the business to bring you this all-new bundle with 1000s of the best quality vectors you can find today, without the hefty price tag! 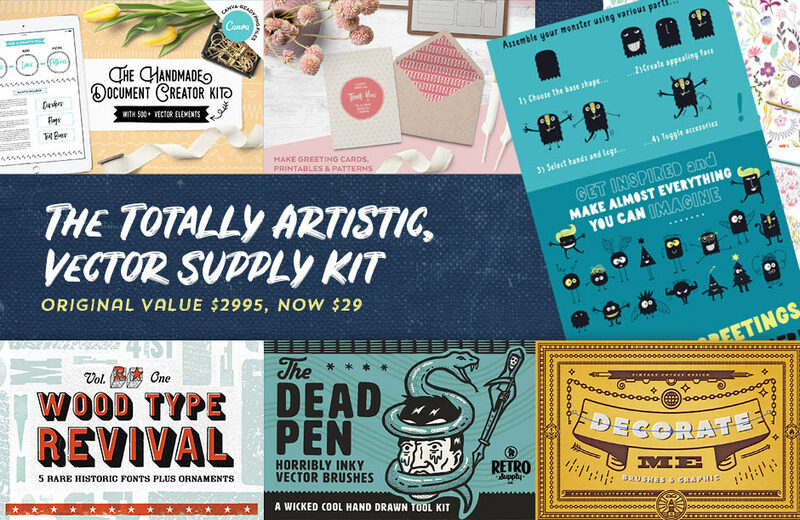 It offers a huge variety of inspiring, creative vector elements, including hand-illustrated graphics, vintage and festive illustrations and fonts, decorative flourishes & florals, logo creators, brushes, monster creators, geometric shapes and much more. For a full look at the massive range of items this collection includes, and for some inspiring ideas on how these assets can be used to create stunning artwork, check out the complete deal page. You’ll also discover more information about the full licensing included with these items, and unlimited support available from the friendly Design Cuts team.